Each year millions of Americans put away their work clothes for the final time and call it a career. But many of these retirees don’t just retire and stay put. Many venture off to the warmer climes of Arizona or Florida to take advantage of year-round heat and relatively low costs of living. These retirees bring with them hard earned, and carefully saved, retirement income. This makes retirees an important part of any local economy in which they arrive. 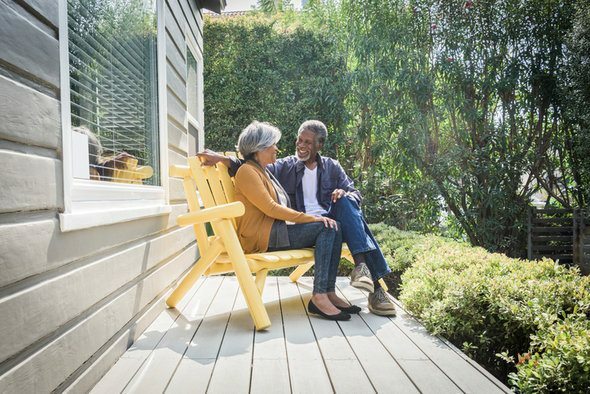 Thinking about retirement? Check our retirement calculator to see how much you should be saving. 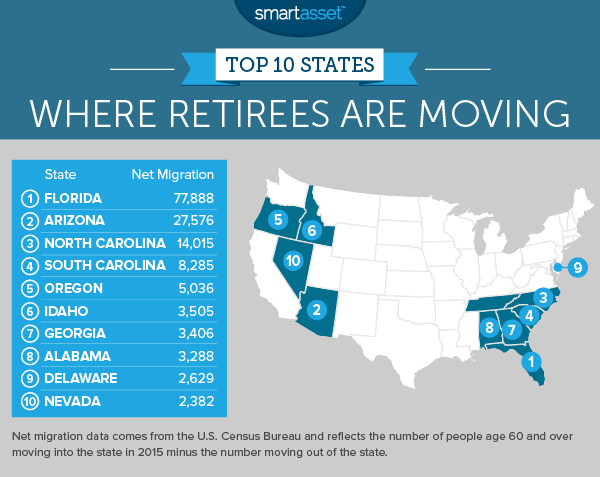 In order to determine where retirees are moving to, SmartAsset analyzed migration data from the U.S. Census Bureau. Specifically, we compared the number of people ages 60 and over who emigrated from a city or state and compared it to who immigrated. The places with the highest positive net immigration were the places where retirees are moving to the most. Overall we analyzed data on 218 different cities and all 50 states. 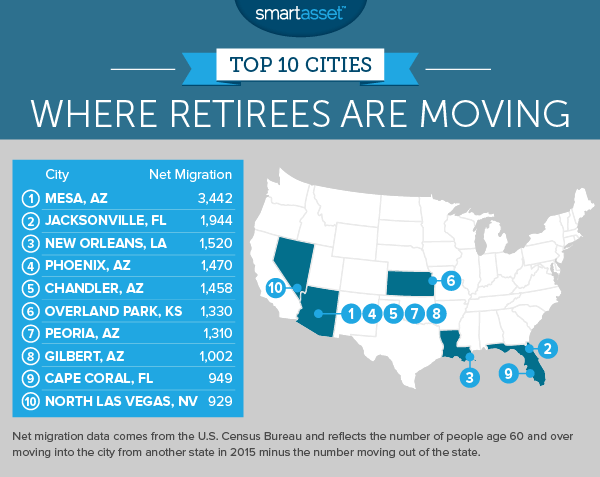 This is SmartAsset’s second annual study on where retirees are moving. Check out the 2016 edition here. Florida leads the away once again as the premier destination for retirees. With a net gain of just under 78,000 retirees, Florida outranked second-place Arizona by almost 50,000 retirees. 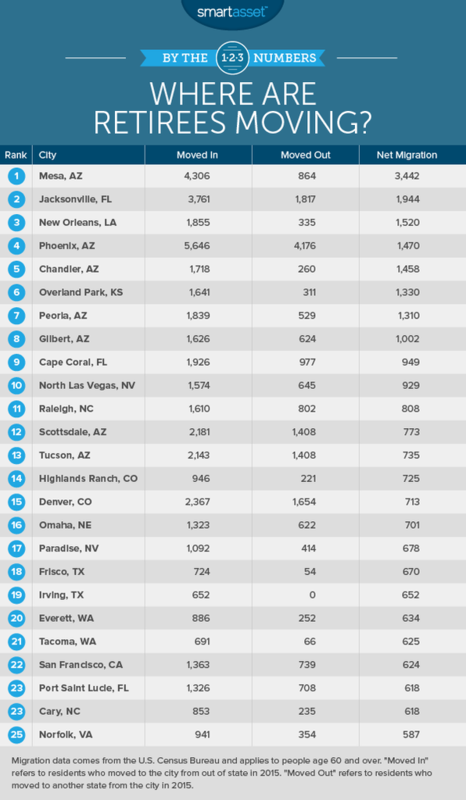 Florida’s total population is much larger than Arizona’s so perhaps that isn’t too surprising. Overall the top four states where retirees are moving share quite a bit in common. Florida, Arizona, North Carolina and South Carolina are relatively warm, sunny and generally affordable. A tax-friendly environment is a common trend our top 10 states. Neither South Carolina nor North Carolina tax social security income. Florida does not tax withdrawals from retirement accounts, Georgia provides a $65,000 tax deduction on all types of income for those over the age of 64 and 10th-ranked Nevada is a very friendly retirement tax state. Alabama and Delaware, which ranked eighth and ninth, respectively, are also tax-friendly states for retirees. The other two states in our top 10, Oregon and Idaho, are a little harder to explain as they lack both the warm weather and the tax friendliness of the other states. In fact, Idaho went from being a state retirees were mostly leaving last year, to one of the most popular destinations this year. Perhaps in Idaho’s case affordability is the key. We found that to retire in Idaho Falls, for example, you only need to save up around $400,000. As for Oregon maybe golf partially explains it. We recently found that Portland, Oregon is the best city for people who love to golf. And if there is one group who love to golf, it’s retirees.